2 The Old School is a fabulous newly renovated three-storey conversion of part of an old Victorian school available for luxurious holiday lets from May 2018. This stylish holiday home, with three bedrooms and two contemporary bath/shower rooms, has been cleverly reconfigured to create a stunning open plan kitchen/dining and living area and has been completely refurbished throughout with high quality fixtures and fittings. This would be ideal for up to three couples or a family wanting to stay in the heart of the highly sought after Georgian village of Burnham Market, within minutes walk from the picturesque village green. 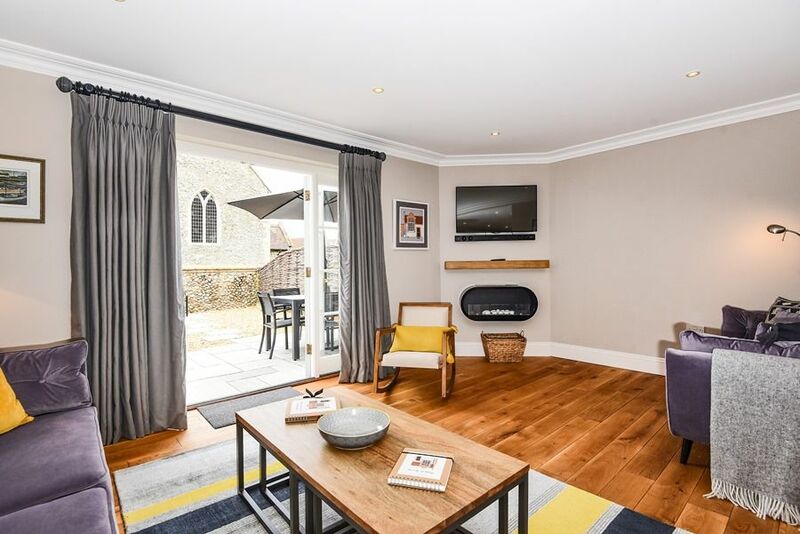 Outside there's the bonus of one off-street parking space and an attractive private fully enclosed courtyard rear garden which overlooks the charming Burnham Ulph church. The beautiful unspoilt beaches of the North Norfolk coast may easily be reached within a 10 minute drive. Fabulous newly created sociable open plan kitchen,dining and living area. Kitchen area: a superb newly fitted kitchen with granite worktops. There is a built-in electric oven, induction hob, microwave, slim-line dishwasher, a fridge/freezer and a washer/dryer . There is a dining table which may seat up to 6 people. Sitting area: beautifully presented with a newly installed bio-ethanol fire and French doors opening out to the paved and gravelled garden overlooking the church. There are two large comfy sofas, coffee table, wall-mounted digital TV with Freeview, (access to Netflix can be arranged. There's the advantage of wifi provided in the cottage. The stairs lead up from the hallway and are not steep with a hand rail. Bedroom 1: Beautifully presented light and airy room with a large window (with shutters) overlooking the church. There's a super king-size bed, large bedside chest of draws/dressing table and lamps, and built-in wardrobes with plenty of storage space. En-suite shower room: newly fitted with contemporary walk-in shower, hand basin, WC and heated towel rail. Bedroom 2: A slightly smaller room at the front with a double bed, bedside tables and lamps, and built-in cupboards with plenty of storage space. Shutters are also fitted to the inside of the window. Bathroom: contemporary bathroom having a bath with shower over, hand basin, heated towel rail and WC. The stairs are not steep and lead to a landing area with a desk and chair. Bedroom 3: Lovely room with a pitched ceiling, king-size bed, bedside tables and lamps and built-in cupboards. There are hairdryers in bedroom 1 and bedroom 3 and fans provided for all bedrooms. Quietly situated off North Street with one designated off-street car parking space in the shingle drive at the front of the property. There is a lockable shed available to use for the storage of bicycles if required. At the back is a private fully enclosed walled and newly paved and shingled garden with outside furniture and BBQ.